K. C. Douglas (November 21, 1913 ? October 18, 1975) was an American blues singer and guitarist. Born in Sharon, Mississippi, Douglas was a rural blues stylist in the San Francisco/Oakland area of California. Douglas was influenced by Tommy Johnson, whose "Canned Heat Blues" he adapted on his album, Big Road Blues. Douglas produced a blues classic when he recorded "Mercury Boogie" in 1949. The tune, which paid homage to the American automobile, was later renamed "Mercury Blues" and covered by Steve Miller, David Lindley, and Dwight Yoakam. Born in Sharon, Mississippi, Douglas was a rural blues stylist in the San Francisco/Oakland area of California. Douglas was influenced by Tommy Johnson, whose "Canned Heat Blues" he adapted on his album, Big Road Blues. Douglas produced a blues classic when he recorded "Mercury Boogie" in 1949. The tune, which paid homage to the American automobile, was later renamed "Mercury Blues" and covered by Steve Miller, David Lindley, and Dwight Yoakam. Alan Jackson had a number one hit when he recorded the tune in 1992. In the early 1960s Douglas recorded such songs as "Born in the Country," "Catfish Blues," "Fanny Lou," "Hear Me Howlin'," "K.C. 's Doctor Blues," and "Wake Up Workin' Woman" for Chris Strachwitz, mostly released on Strachwitz's Arhoolie Records and the Prestige Bluesville label. 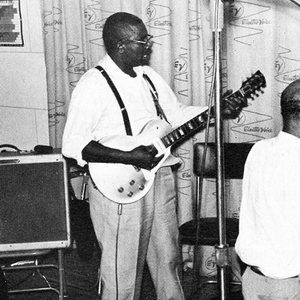 In 1961, Douglas played guitar on Sidney Maiden's album, Trouble An' Blues, thus reuniting a working partnership for both of them that had started in the 1940s. Douglas did not reach his peak until the 1970s. He played at the San Francisco Blues Festival in 1973 and 1974. He formed a quartet and became a frequent performer at coffeehouses, clubs, and bars in the East Bay/Modesto/Stockton area. Succumbing to a fatal heart attack in Berkeley, California in October 1975, Douglas was buried in the Pleasant Green Cemetery in Sharon, Mississippi. While in his 30s and working at a garage, Douglas taught blues guitar to the young grandson of his employer - Steve Wold.